Gainesville is notorious for being hostile territory if you side with the enemy. The Swamp is one of the loudest stadiums in the country and one of the toughest venues in all of college athletics. 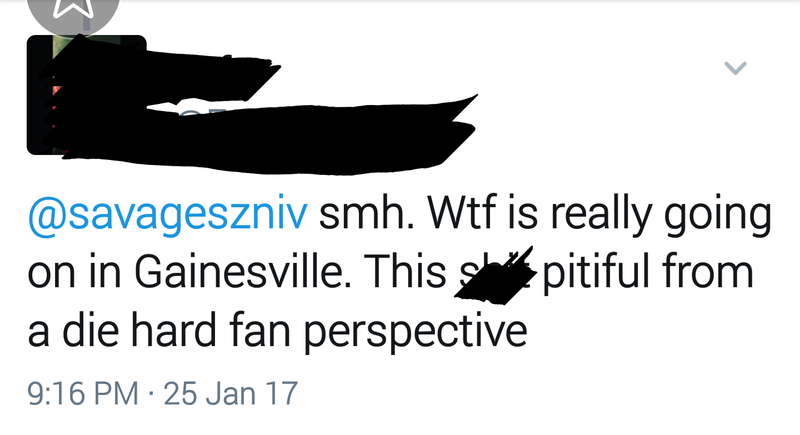 Florida fans are extremely proud of this reputation, but in the age of social media a new word can represent a fraction of the Florida faithful. Embarrassing. Let me start by saying that I do understand that only a tiny portion of the Gators fan base is embarrassing. 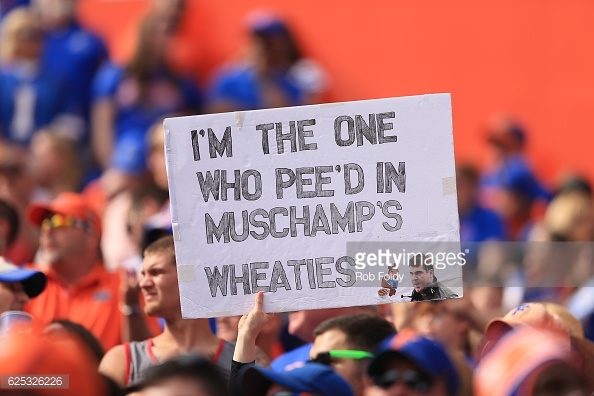 The vast majority of Florida fans are quite the opposite. If you haven’t done anything to embarrass yourself or your fellow fans, then clearly I’m not talking about you. However, several Florida fans openly called out an 18 year old high school student last night who made a decision that will impact the rest of his life. These Gators fans were unhappy and let it be known when Elijah Blades announced his decommitment from UF. Blades tweeted that at 9:00 PM EST and it didn’t take long for Florida fans to take notice. Blades also sent out another tweet at 12:46 AM expressing the “hate” he had received since his announcement. 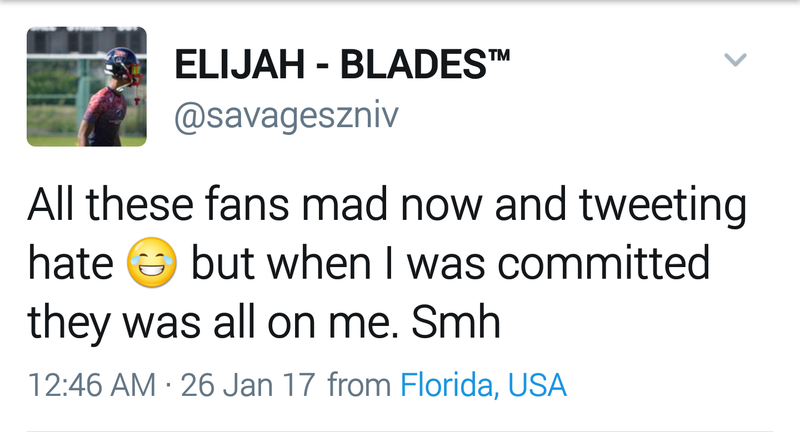 Blades received a lot of “hate” from Florida fans. Here is a small sampling of what Gator fans had to say with just a bit of commentary from my view. #1 a verbal commitment is non-binding and all coaches know this. #2 we’ve seen the national attention to coaches pulling scholarships, so if a coach can pull a scholarship, why can’t a player change his mind before he’s signed his letter of intent? While we are talking about keeping it classy, maybe name calling isn’t the best bet. Lie isn’t exactly the right word. He told us he was committed to Florida, but things change. It happens every year. At least he let us know before signing day unlike Shavar Manuel in 2016. Actually, Florida was not the first to offer Blades a scholarship. Utah and Arizona appear to have both offered Blades before Florida. 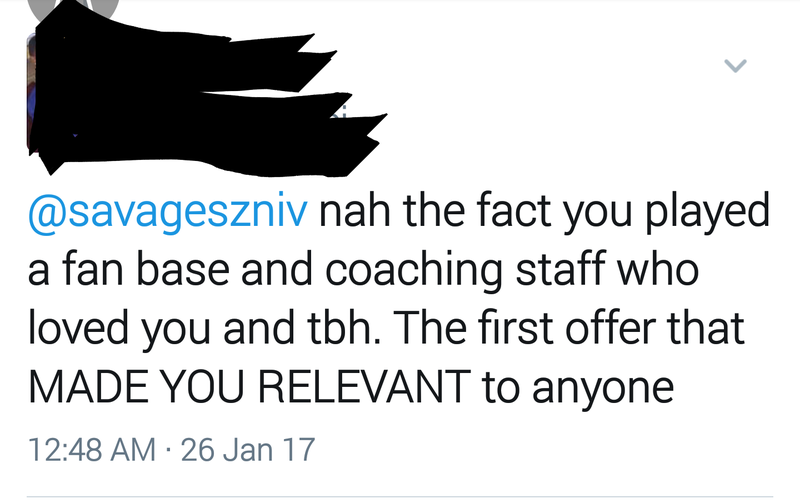 Oh, and a scholarship offer doesn’t make someone relevant. He earned his relevance by hard work and his talents on the field. Look, we all agree (or believe) Florida is DBU. But that doesn’t mean that if he goes to Nebraska or USC that he won’t go in the first round. It’s unfair to say that. It will be entirely up to how he plays, no matter where he goes. Blades used the wrong “there” in his decommitment tweet. So what? 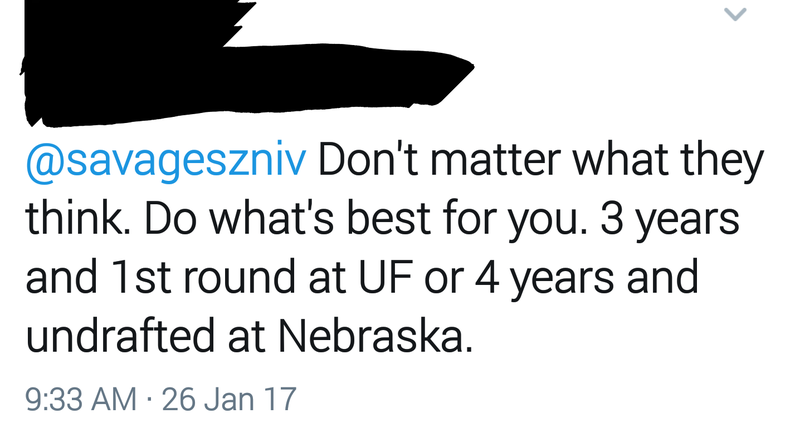 If he was announcing his decommitment from Georgia and Florida was in the running for his services, no Gator fan would care. This wasn’t aimed at Blades, was more directed at the Florida coaching staff and the perceived poor recruiting. However, this was sent directly to Blades, so it counts. 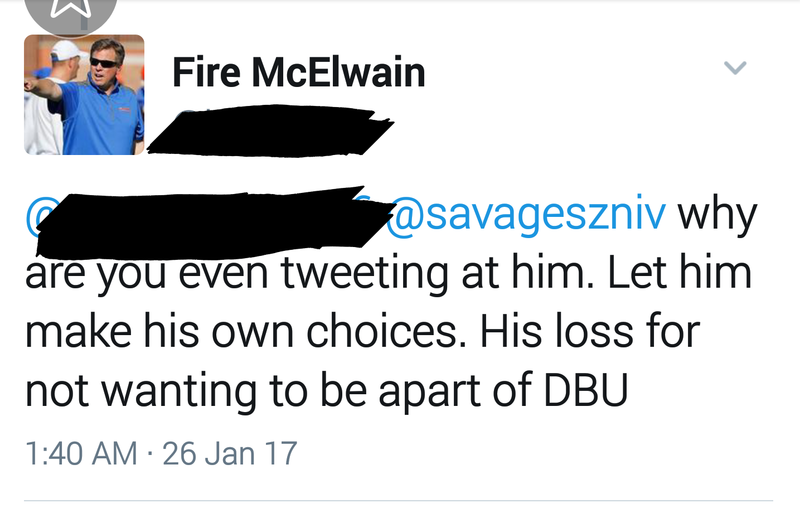 The only issue with this is tweet is that it was sent to Blades with the profile name Fire McElwain. If Blades is committing to Florida, he will be committing to Coach Mac. 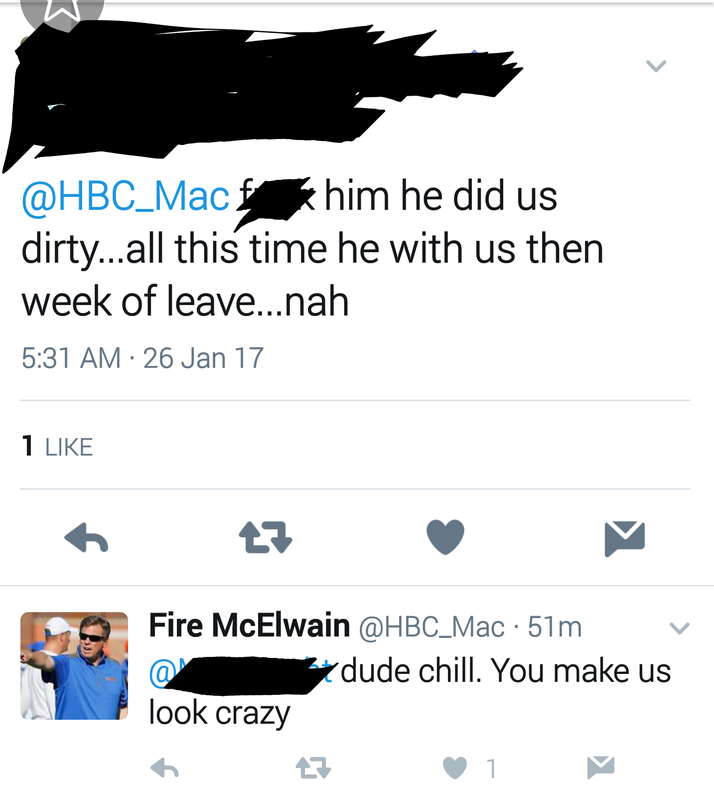 If Florida fans want Mac to be fired, why would he want to come here for this coach? In December 2015, Under Armour did a poll amongst their high school All-American’s to find out which college fan base has the most annoying fans. Not surprisingly, Florida finished first. Fans that get on social media and mock athletes for making decisions that will affect their future are the worst kind. It’s the choice of the student athlete as to where they want to attend, and that choice can be influenced by any number of things. What makes this worse: Blades said that Florida was still in the running for him. I can’t speak for him, but if I look at my timeline and see the “hate” he has, Florida would probably fall off that list. Gator Nation, when it comes to recruiting, stay off of social media. Let the student-athletes make their own decisions. Let the coaching staff do their jobs and try to convince these individuals that Florida is the place for them. It’s not our job to recruit these guys as fans. I know this happens everywhere, but don’t let that be an excuse. Gator Nation, we can do better than that.